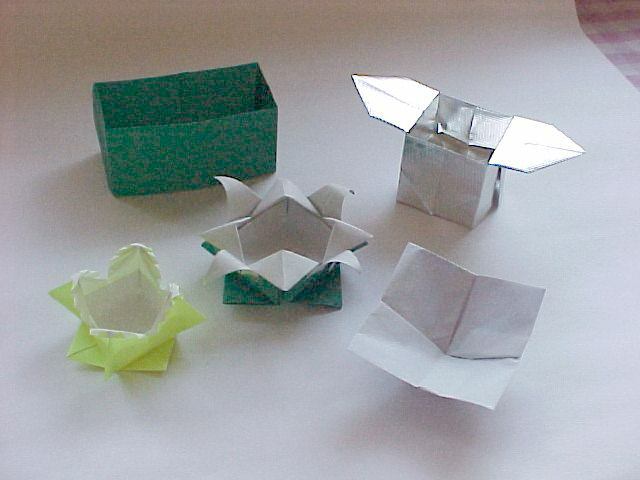 A cluster of Assorted Origami Boxes. At left back (Green), Pop up Box by Paul Jackson. Diagrams on his web site. See Links. Back right (Silver Foil), Sanbow, a traditional Japanese Offering tray. From Robert Harbin's 'Origami 1'. Front Left (Yellow), another traditional Japanese Box that Harbin called the Spanish Box. Again from his 'Origami 1'. Front middle (Green), HELP, I don't know where I got these diagrams from ! If you know it, please let me know. Front right (White), the Bowl de Vicenza by Maarten van Gelder.